The SKARB is an interesting sharpener. 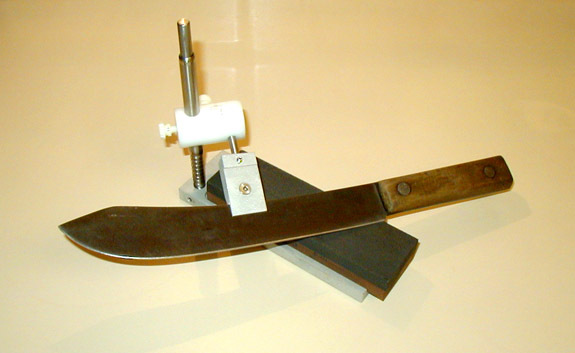 It uses bench stones and the guide holding the knife pivots on a vertical rod. I have played with the Skarb a little, but have not sharpened a lot of knives on it. My first impressions of the Skarb are that it is very well made, but not very well thought out. First, the clamp. The Skarb uses a single screw positioned so that there is actually a 1:2 leverage reduction in the clamp pressure. The Skarb uses an recessed Allen screw, which keeps a nice low clamp profile and helps with the clamping pressure issue, but the Allen wrench is one more piece of equipment to lose. Still it is much better than the Razor's Edge clamp with four screws requiring two different Allen wrenches. By contrast, the Lansky, GATCO and DMT Aligner clamps use from 1:1 to over 2:1 leverage increase to get a tight clamp with finger tightened screws. Second, the angle. I used a 10" old-fashioned butcher knife for my first trial; the type with a big belly like a skinning knife. My Skarb measured 17 degrees when set for 20 degrees on this blade. Not bad, about the same error as a Lansky, while the GATCO is off by as much as 6 degrees. (DMT wisely did not specify their angles.) But by the time the blade had been swung around to the tip, the angle had increased to 30 degrees! True, the guide maintains a constant angle to the vertical post, but it had to rise up the post so far that the compound angle at the tip measured 30 degrees to the stone. Finally, the edge. I did not get the Skarb stone, but understand it is nothing special. The Skarb uses only a small amount of the stone, making it possible to sharpen a very long blade on a short stone. My 10" blade used only 2 1/2 of stone, and the full 8" stone would have easily handled an 18" blade. The scratch pattern is nearly parallel to the edge, especially near the clamp. This could result in an edge that chips easily, but this becomes less of a concern if a fine stone is used for the final step. Even with soft stones like coarse waterstones stone wear is not a problem, despite the Skarb using only a small section, because the stone can be easily slid to a new position to distribute the wear. Overall, I do not recommend the Skarb sharpening system, but it may be your best choice if you want to continue using your bench stones. Company and product names are trademarks of their respective companies.